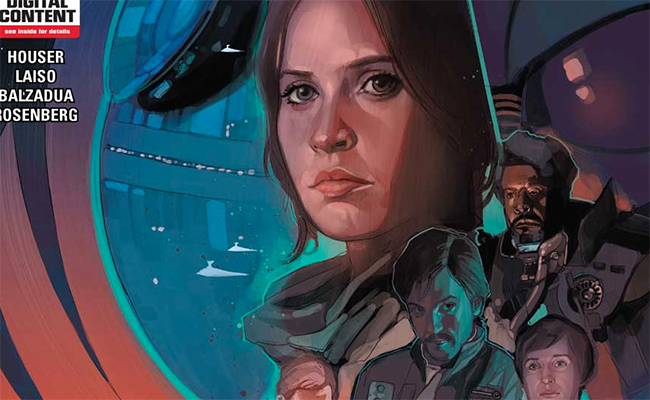 Written by Jody Houser and drawn by Emilio Laiso, issue one of six of Rogue One: A Star Wars Story, from Marvel Comics, delivers a solid start. As an adaptation of Gareth Edwards’ recent feature film of the same name, Rogue One follows the movie’s most pivotal and emotionally intimate scenes to keep the plot moving like a highlight reel. Issue one starts with an emphasis on Galen Erso’s reluctant role as a Death Star engineer and Jyn’s troubled backstory of hardship under the Empire’s reign. The movie quickly weaves in the rogue Imperial pilot Bodhi Rook, as well as other rogues such as Cassian Andor and the reprogrammed Imperial droid, K-2SO. Issue one ends on a quiet note as Chirrut Imwe and Baze Malbus consider their next move in Jedha City. Laiso’s art expertly brings the Star Wars universe to life. The characters are all well-drawn and are easy to recognize from the live-action movie, and their expressions of shock, muted anger, guilt and other, subtler emotes are clearly rendered on the page. Sharp lines and rich colors keep everything in focus, and issue 1’s use of closeups and dramatic angles give it a cinematic feel. Marvel’s Rogue One: A Star Wars Story comic mini-series is intended to expand on the movie and include scenes and characters omitted from the film, and though issue one closely follows the film, only a few panels show new material, namely Jyn’s tense relationship with a violent, fellow prisoner of the Empire. Future issues, however, may contain more, given how much of the movie’s plot is already contained in the first issue. Monáe rocked an orange jumpsuit (The Venture Bros.